Patients complaining of back pain after motor vehicle accidents or falls from significant heights should be considered to have spinal injuries until proved otherwise. With flexion-distraction mechanisms such as those observed in passengers restrained with lap seatbelts, a progression of injury from the posterior column of the thoracolumbar spine is observed anteriorly. When this involves only the osseous structures, a Chance injury exists. The diagnosis is best made on good quality radiographs obtained in two planes (anteroposterior [AP] and lateral). Prompt recognition followed by appropriate reduction and immobilization usually results in a good clinical outcome. Associated intra-abdominal injuries are common, [6, 7, 8] especially in the pediatric age group, [9, 10, 11] where the incidence approaches 50%. Thus, intra-abdominal trauma should always be excluded at the time of presentation. Surgery generally has not been used to treat this injury. Because Chance fracture is a pure bony lesion and reduction is readily obtainable with extension, closed management of this injury has been the treatment of choice. The usual location for Chance fractures is at the thoracolumbar junction (T10-L2) in adults or the midlumbar spine in the pediatric age group. The fracture lines are found to propagate from the spinous process posteriorly through the lamina, pedicles, and vertebral body anteriorly. Conceptually, the thoracolumbar spine may be visualized as comprising three columns, as described by Denis. The anterior column is represented by the anterior half of the vertebral body, disk, and anterior longitudinal ligament. The middle column consists of the posterior half of the vertebral body, its associated disk, and posterior longitudinal ligament. The posterior column includes the pedicles, facet joints, lamina, and spinous and transverse processes, as well as the ligamentous complex, including the ligamentum flavum. Drawing of Chance fracture of thoracolumbar junction. Defect follows irregular horizontal plane (arrows), which results in disruption of anterior (black dotted line), middle (red dotted line), and posterior columns (blue dotted line). 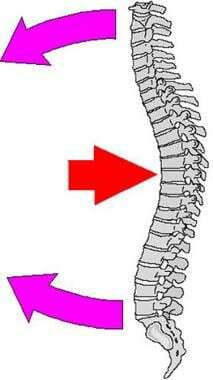 Chance fracture or modified compression fracture of upper lumbar spine may occur when weight of upper body moves forward (red arrow) while person's waist and upper body are fixed in position by seatbelt or steering wheel of automobile (pink arrows). Consequent fixed-position stress results in fracture. The most common history is that of a back-seat passenger who was involved in a motor vehicle accident while restrained by a lap seatbelt  or that of a person who fell from a height. Fewer than 10% of fractures involving the lumbar spine are a result of flexion-distraction forces. These injuries tend to occur between T12 and L4, with the highest incidence at L2. Eismont FJ, Cuartas E. Flexion-distraction injuries of the thoracic and lumbar spine. Zigler JE, Eismont FJ, Garfin SR, Vaccaro AR, eds. Spine Trauma. 2nd ed. Rosemont, IL: American Academy of Orthopaedic Surgeons; 2011. Chance GQ. Note on a flexion fracture of the spine. Br J Radiol. 1948. 21:452-3. Gordon ZL, Gillespie RJ, Ponsky TA, Barksdale EM Jr, Thompson GH. Three siblings with Chance fractures: the importance of 3-point restraints. J Pediatr Orthop. 2009 Dec. 29 (8):856-9. [Medline]. Eghbal K, Abdollahpour HR, Ghaffarpasand F. Traumatic Chance Fracture of Cervical Spine: A Rare Fracture Type and Surgical Management. Asian J Neurosurg. 2018 Jul-Sep. 13 (3):906-909. [Medline]. [Full Text]. Ragel BT, Allred CD, Brevard S, Davis RT, Frank EH. Fractures of the thoracolumbar spine sustained by soldiers in vehicles attacked by improvised explosive devices. Spine (Phila Pa 1976). 2009 Oct 15. 34 (22):2400-5. [Medline]. LeGay DA, Petrie DP, Alexander DI. Flexion-distraction injuries of the lumbar spine and associated abdominal trauma. J Trauma. 1990 Apr. 30 (4):436-44. [Medline]. Triantafyllou SJ, Gertzbein SD. Flexion distraction injuries of the thoracolumbar spine: a review. Orthopedics. 1992 Mar. 15 (3):357-64. [Medline]. Mulpuri K, Reilly CW, Perdios A, Tredwell SJ, Blair GK. The spectrum of abdominal injuries associated with chance fractures in pediatric patients. Eur J Pediatr Surg. 2007 Oct. 17 (5):322-7. [Medline]. Reid AB, Letts RM, Black GB. Pediatric Chance fractures: association with intra-abdominal injuries and seatbelt use. J Trauma. 1990 Apr. 30 (4):384-91. [Medline]. Andras LM, Skaggs KF, Badkoobehi H, Choi PD, Skaggs DL. Chance Fractures in the Pediatric Population are Often Misdiagnosed. J Pediatr Orthop. 2016 Dec 23. [Medline]. Smith WS, Kaufer H. Patterns and mechanisms of lumbar injuries associated with lap seat belts. J Bone Joint Surg Am. 1969 Mar. 51 (2):239-54. [Medline]. Hu X, Lieberman IH. Proximal instrumented vertebral body chance fracture after pedicle screw instrumentation in a thoracic kyphosis patient with osteoporosis. J Spinal Disord Tech. 2015 Feb. 28 (1):31-6. [Medline]. Pitta M, Wallach CJ, Bauk C, Hamilton WG. Lumbar chance fracture after direct anterior total hip arthroplasty. Arthroplast Today. 2017 Dec. 3 (4):247-250. [Medline]. [Full Text]. Mulpuri K, Jawadi A, Perdios A, Choit RL, Tredwell SJ, Reilly CW. Outcome analysis of chance fractures of the skeletally immature spine. Spine (Phila Pa 1976). 2007 Nov 15. 32 (24):E702-7. [Medline]. Schoenfeld AJ, Wood KB, Fisher CF, Fehlings M, Oner FC, Bouchard K, et al. Posttraumatic kyphosis: current state of diagnosis and treatment: results of a multinational survey of spine trauma surgeons. J Spinal Disord Tech. 2010 Oct. 23 (7):e1-8. [Medline]. Parizel PM, van der Zijden T, Gaudino S, Spaepen M, Voormolen MH, Venstermans C, et al. Trauma of the spine and spinal cord: imaging strategies. Eur Spine J. 2010 Mar. 19 Suppl 1:S8-17. [Medline]. Bernstein MP, Mirvis SE, Shanmuganathan K. Chance-type fractures of the thoracolumbar spine: imaging analysis in 53 patients. AJR Am J Roentgenol. 2006 Oct. 187 (4):859-68. [Medline]. Beringer W, Potts E, Khairi S, Mobasser JP. Percutaneous pedicle screw instrumentation for temporary internal bracing of nondisplaced bony Chance fractures. J Spinal Disord Tech. 2007 May. 20 (3):242-7. [Medline]. Schizas C, Kosmopoulos V. Percutaneous surgical treatment of chance fractures using cannulated pedicle screws. Report of two cases. J Neurosurg Spine. 2007 Jul. 7 (1):71-4. [Medline]. McAnany SJ, Overley SC, Kim JS, Baird EO, Qureshi SA, Anderson PA. Open Versus Minimally Invasive Fixation Techniques for Thoracolumbar Trauma: A Meta-Analysis. Global Spine J. 2016 Mar. 6 (2):186-94. [Medline]. [Full Text]. Le TV, Baaj AA, Deukmedjian A, Uribe JS, Vale FL. Chance fractures in the pediatric population. J Neurosurg Pediatr. 2011 Aug. 8 (2):189-97. [Medline]. Arkader A, Warner WC Jr, Tolo VT, Sponseller PD, Skaggs DL. Pediatric Chance fractures: a multicenter perspective. J Pediatr Orthop. 2011 Oct-Nov. 31 (7):741-4. [Medline]. Dimar JR, Fisher C, Vaccaro AR, Okonkwo DO, Dvorak M, Fehlings M, et al. Predictors of complications after spinal stabilization of thoracolumbar spine injuries. J Trauma. 2010 Dec. 69 (6):1497-500. [Medline]. Anterior view of Chance fracture of L2 vertebral body. 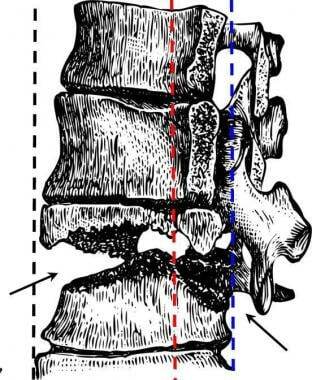 Fracture line follows horizontal plane through L2 vertebral body and transverse processes (arrows).